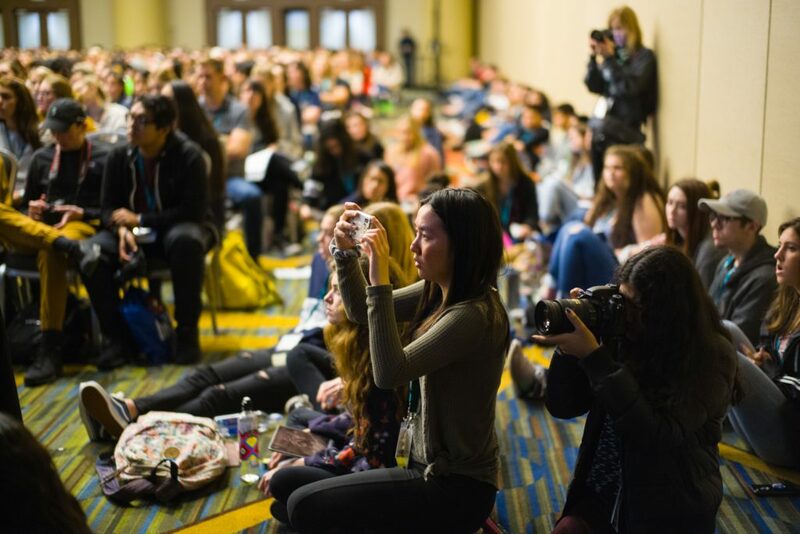 At the JEA/NSPA National High School Journalism Convention, students shoot photos during “Covering a Tragic Event in Your Publication,” a special breakout session offered April 13, 2018 in San Francisco. A new grant from JEA and NSPA brings first-time attendees to the National High School Journalism Convention. The First-time Convention Grant provides a professional learning package for the adviser and two students, complete with free rooms in the NHSJC hotel, complimentary registration, preconvention workshop sessions, Write-off entries and a publication critique. “This is a great opportunity. Going to conventions has changed everything about how I teach journalism,” Julie Goldstein, publications adviser at Green Valley High School (Henderson, Nev.), said. Teachers will have the opportunity to connect with other journalism educators and receive support through Thursday’s Outreach Academy and will receive a free ticket to Saturday’s award luncheon. Students can meet, learn and experience the NHSJC with other first-time attendees and will receive free tickets to network and celebrate with their peers during Friday evening’s Pizza & Proud event. “Attending a national convention is truly a transformative experience. We want every teacher and student to get a chance to be part of that whirlwind of excitement and professional growth. From the top-notch instruction of breakout sessions, workshops and critiques to the validation of meeting others in similar situations and the power of forming relationships with peers, attendees leave with new skills they can apply and share in their own classrooms and newsrooms,” JEA President Sarah Nichols, MJE, said. The First-time Convention Grant is designed to provide an immersive experience for small groups eager to take advantage of the full NHSJC program. Each of the four adviser/student groups selected will need to provide their own transportation to Chicago. Teachers may apply here by Oct. 1. Recipients will be notified Oct. 3 in order to complete the registration process.